We’d love your help. 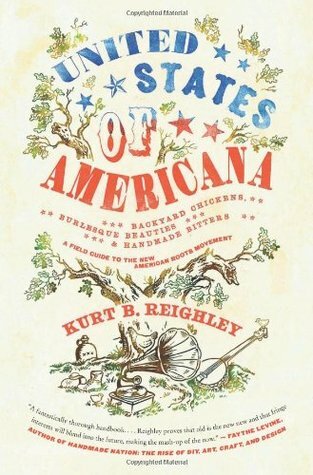 Let us know what’s wrong with this preview of United States of Americana by Kurt B. Reighley. To ask other readers questions about United States of Americana, please sign up. Unique and enjoyable, this book is a survey of the contemporary DIY (do-it-yourself) movement in America (with some global threads), all at once a history, reference book, and how-to manual. In 10 chapters, Reighley cuts a wide swath through sub-sub-cultures including backyard farming, handcrafting, fashion, taxidermy, and circuses. He's is at his best when either describing the "how" in such subcultures (How to grow a handlebar mustache? How to raise chickens? How to make pickles? ), or delving de Unique and enjoyable, this book is a survey of the contemporary DIY (do-it-yourself) movement in America (with some global threads), all at once a history, reference book, and how-to manual. He's is at his best when either describing the "how" in such subcultures (How to grow a handlebar mustache? How to raise chickens? How to make pickles? ), or delving deep into such topics as "Americana" music, old-fashioned drinking, and handmade crafts--home-run stuff, here, freshly told and full of information. At other times (in the middle chapters, particularly) the book verges towards merchandise catalogue--bespoke suits, selvage jeans, handmade shoes, bowler hats. Occasional editing problems also distract: for instance three introductions, in proximity, of Michael Williams blog A Continuous Lean. Perhaps the biggest error is the lack of an index, which to be fair only points out the utility of this "field guide." One really will want to look things up! The book is full of gorgeous illustrations by Aaron Bagley and informative sidebars (What's a Velocipede? What are spats? What is a Daguerreotype?). Mini-chapters explain some things in more depth: how to shop vintage; what are Root bitters; how to join the circus; the differences between knitting and crocheting. The book itself is like Harry Smith's Anthology of American Music, a cabinet of curiosities (both topics covered), or a Joseph Cornell box: a slice in time and context that one can examine again and again, always finding something new and fascinating. Great book on American history and the new DIY movement. What a fun book! It's a little dated now, but I enjoyed it anyway. It was written with the care and detail only a journalist could bring - facts, figures, statistics, and lots of great short interviews with all of his sources. Being a boomer, it's not my first go-round with Americana, and I was amused that there are people who think buying quality is a Brand New Thing. This is what would happen if Whole Earth Catalog collaborated with Robb Report. Interesting to see someone try to draw an overarching theme across so many subcultures; I don't think these interests is as nationalistic as the title implies. This book fully encompasses the movement that allows us all to do things for ourselves, learn a skill, and appreciate the simplicity of everything from food to fashion. Resources and examples are heavily based on the PNW experience, however, a nod is given to the DIY/old-is-new culture throughout the US. Good read, well worth the time even if you consider yourself "front and center" in what is termed the American roots movement. Very good over all (if a bit preaching to the choir in my case) - a nice guide to the 'back to the roots' movement that has swept parts of the US in recent years. The chapter on the roots of american music is a particularly valuable primer. The vintage cocktail recipes in the drinks chapter will come in handy as well. My only complaint that the book as a whole was very Brooklyn-San Francisco-Portland-Seattle-centric. Fast easy read for those interesting in re-discovering the roots of low volume (relatively speaking) goods of all types. Interesting from historical and practical perspective. Book made me want to visit Brooklyn, next time in NYC. Aiuthor is from Seattle so there is an emphasis on Pacific Northwest. I enjoyed so much about this book, I just wish it hadn't felt as though it was all so crammed together. I think the author had so much knowledge in each subject that it felt rushed to get it all in- especially in the music section. It was an engaging and interesting read, but I wish there had been more time for each subject. An interesting read, but I feel like the author relies very heavily on a few sources, so that at some points it feels like he's pitching for a specific website or author rather than exploring what he claims is a growing movement. I just could not get through this book. While there were some interesting facts, it was dominated with hipster drivel and quotes from people in bands that had nothing to do with the actual stuff he was writing about. Namedropping at its worst. some good stories but the book doesn't fully embrace the narrative potential in the subject matter and rather opts for more of an around-the-horn survey of the Americana trend. Works better as a resource for anyone interested in Americana purveyors than a lean-back read. A how-to book for hipsters who know nothing about American history. One of the things I can say in this book's favor is that the author reinforces the fact that a martini is made with gin. 3.5/5: Some chapters are definitely better/more thoroughly-researched than others, but it paints a nice overall picture of some interesting movements in contemporary culture. This is a fun little read about the rustic romantic revival going on in various parts of the country. Interesting little survey of the "so old it's hip" trends of late. Made me want to try a handle bar mustache, but my wife vetoed it. pickles. carhartts. mustaches. folk music. burlesque. the end.